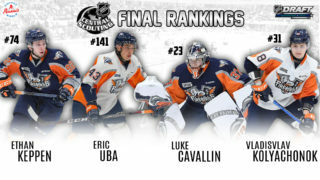 The next wave of OHL talent. 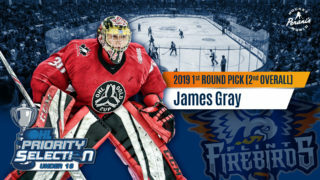 These youth players are next up for the OHL Draft on April 6th. 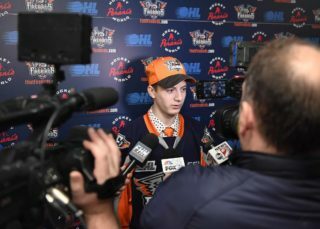 Brandt Clarke to Shane Wright to Brennan Othmann for the overtime winner to earn the Don Mills Flyers the 2019 OHL Cup on Sportsnet. The Flyers played to a perfect 7-0-0 record, becoming the first champion to do so since the 2012 Mississauga Rebels. They tied the 2008 Toronto Jr. Canadiens’ event record 41 goals for while surrendering just 10. Wright (8-10–18) led the way offensively followed by Othmann (8-6–14) and Francesco Arcuri (4-9–13). Goaltenders Thornton and Litvinov finished with sub-1.60 goals-against averages and save percentages of .909 and .910 respectively. The OHL Cup was presented to Flyers captain Ethan Mistry by Hockey Night in Canada Stars and minor hockey advocates Don Cherry and Ron MacLean along with GTHL President Don West and OHL President David Branch. The game was broadcast live on Sportsnet Ontario.